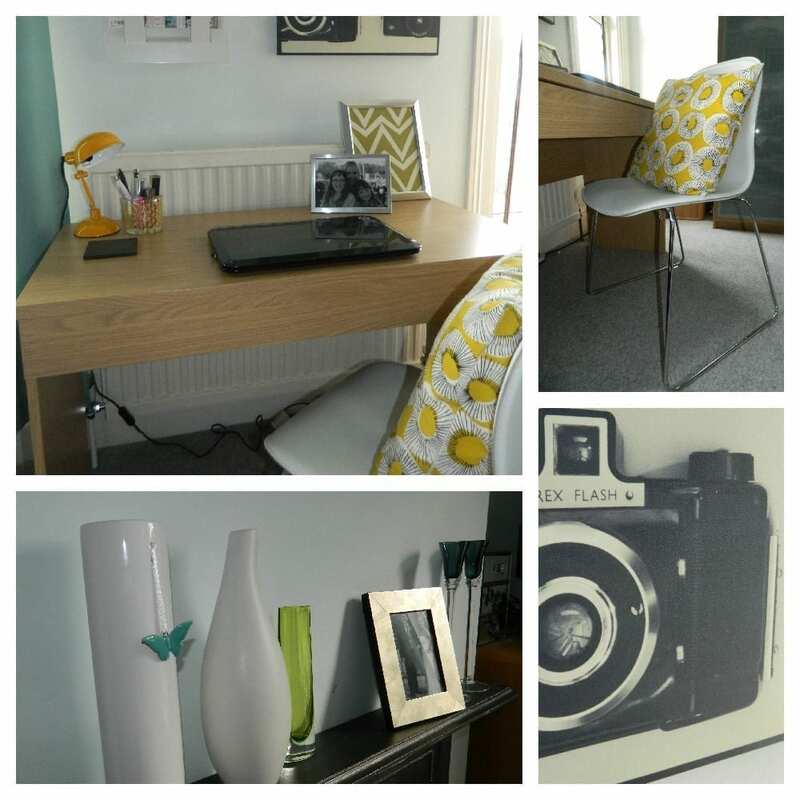 The Love Chic Living Blogger’s Workspace is brought you in association with Argos. As you may know I’ve been putting together a little space in my home where I can blog, write and generally get creative when I need to. For many months now I’ve been working at either the kitchen breakfast bar or at the dining room table. Neither areas are comfortable nor conducive to productive working; if I’m in the kitchen I’m distracted by the kettle and biscuit tin and in the dining room I feel chilly and restless. So it’s been really important to me to create an area when I’m comfortable and not disturbed or distracted and I’ve had great fun shopping at Argos to create just that. I’m pleased to say that the desk area is now complete and I’m ready to show you the results. You may remember that we had space in our bedroom that was underutilised and crying out for some attention. It is big enough to take a small desk and a few extra bits so it seemed sensible that I should work here. Away from the rest of the house it’s quiet too and is light and bright. 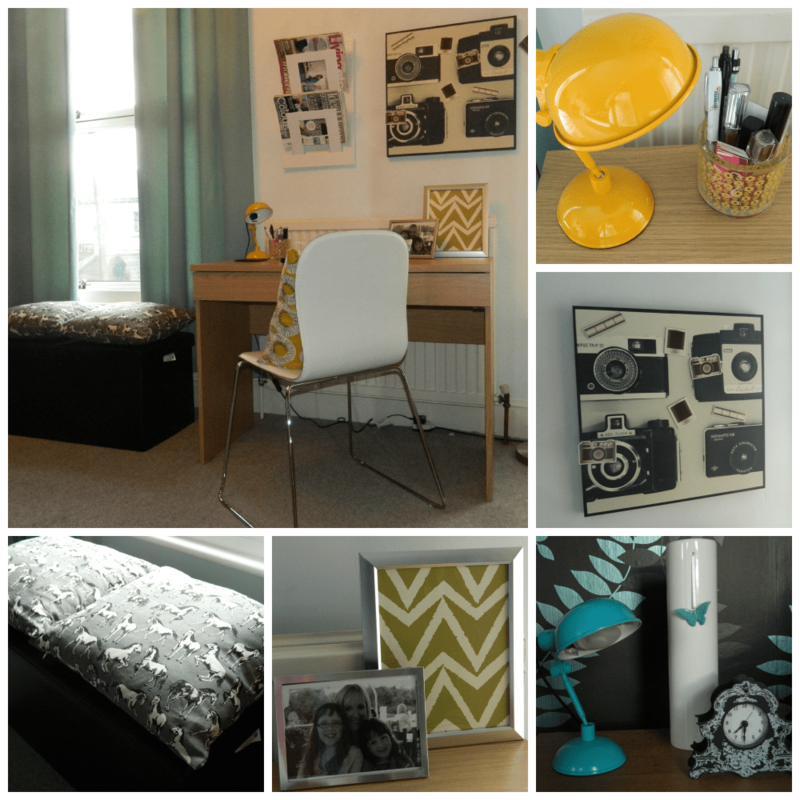 As you can see it’s not a pretty space really so it seemed the obvious choice for my new blogger’s workspace. And so the planning began. If you recall in the last post I put together my moodboard to give me a good sense of what the items would all look like together and how they would fit into the current décor. 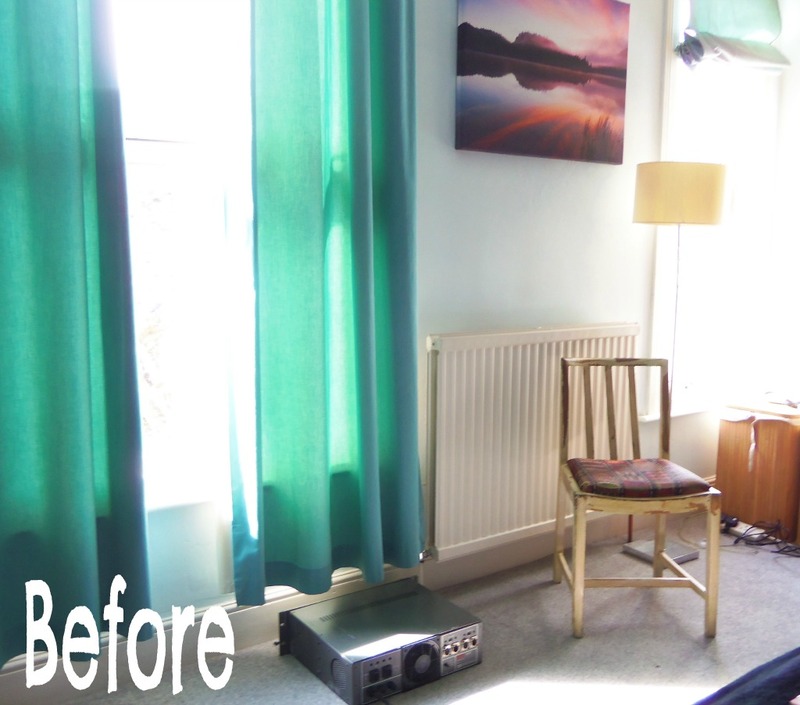 I didn’t have the time or budget to give the room a complete makeover but it was time to inject something fresh and so I chose a new colour, yellow to add to the existing black and teal scheme. 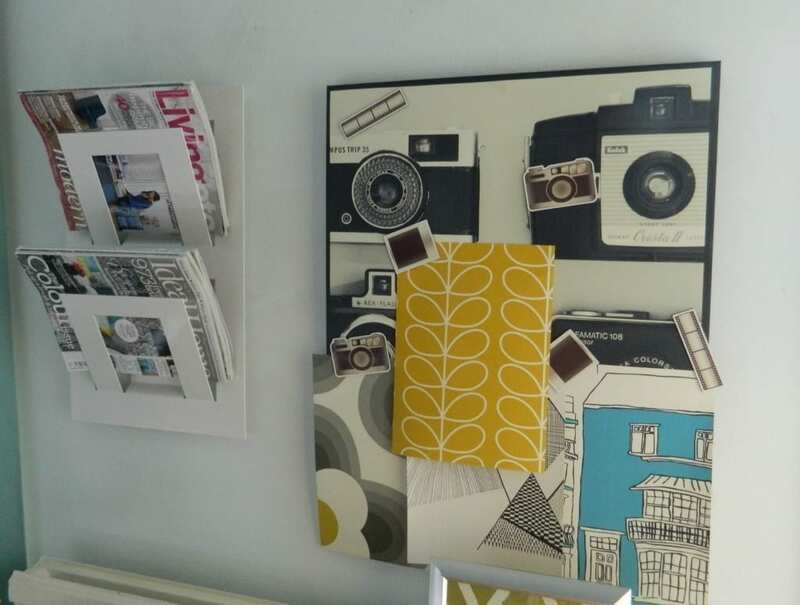 The wallpaper in the moodboard is the actual paper we have on the wall behind the bed, and the rest of the room is painted in a frosty shade of blue. Adding yellow seemed the obvious choice to update the scheme. Desk: This is actually a Schreiber dressing table in Oak with a single soft-closing drawer and was half price at £120. It’s probably not as deep as a proper desk might be but that works just fine for me and it fits beautifully with the rest of our bedroom oak furniture. It’s often a good idea to be flexible when choosing furniture and think about what could work for you. Chair: This is a leather Habitat dining chair (£80) and is wonderfully comfortable. I probably should have gone for something adjustable but I love that this chair gives the look much more of a modern edge. There is a huge selection of chairs at Argos and it took ages choosing the right one! Ottoman: Argos do a great range of inexpensive ottomans and this one is great for storing blog review products as well as providing a little extra seating for when the girls bob upstairs to chat. Cushions: All of the cushions are from the Habitat at Argos range. The yellow Evelyn cushion was just £8 and the Stallions were £12. Lighting: The smaller yellow and blue desk lamps are again from the Habitat at Argos range (£15 each), but the larger industrial looking floor lamp (£30) is from Argos and adds extra lighting in the corner of the room which looks great at night. Again the lighting range at Argos is extensive with a great choice for all styles and looks. Noticeboard: This is from Graham and Brown at Argos, costs £29.99 and is fabulous. Depicting vintage style cameras, it’s really large and will be incredibly useful (I’ve already added wallpaper samples to it!) but I think it looks great as a piece of wall art anyway. If you’re looking for something similar or indeed for more home accessories check it out here. The wall mounted magazine rack is my own. All of the products above came to around £400 with the majority being spent on the desk and chair of course. So what do you think of the end result? I know I love it and it’s made such a difference to the way I work I can’t believe it. It looks great in the bedroom too, which I’m really pleased about and doesn’t look out of place at all. Do you need a desk at home? Could you do something similar or have you, and does it work well for you too? Thank you to Argos for supplying the Home Office products and furniture. The comments and opinions are honest, genuine and my own. Oh my word, I love it! I love everything about it, in fact I want all of those things in MY house! Brilliant job. Love it! I worried about you putting your work space in your office but it looks so stylish, so you and so inspiring I think it works really well! In addition, I don’t know about you, but I often get my best ideas last thing at night/in the middle of the night/very first thing in the morning – to be able to nip across and scribble something down and hop back into bed before you’ve forgotten and properly woken up would be fab! Enjoy your space! I totally love it! The use of yellow is beautiful. You must be so pleased with it. I really need to work on my workspace – at the moments it’s a tiny corner of the dining room facing a wall – I’d love to be facing a window to look out of. Looks fab Jen – I love the cushions! Just fab! I love all of it – especially that very current floor lamp, and what a great price. Who knew Argos had such lovely Habitat pieces, too, and affordable at that. Before after pictures says it all in this blog! Loved each and everything. 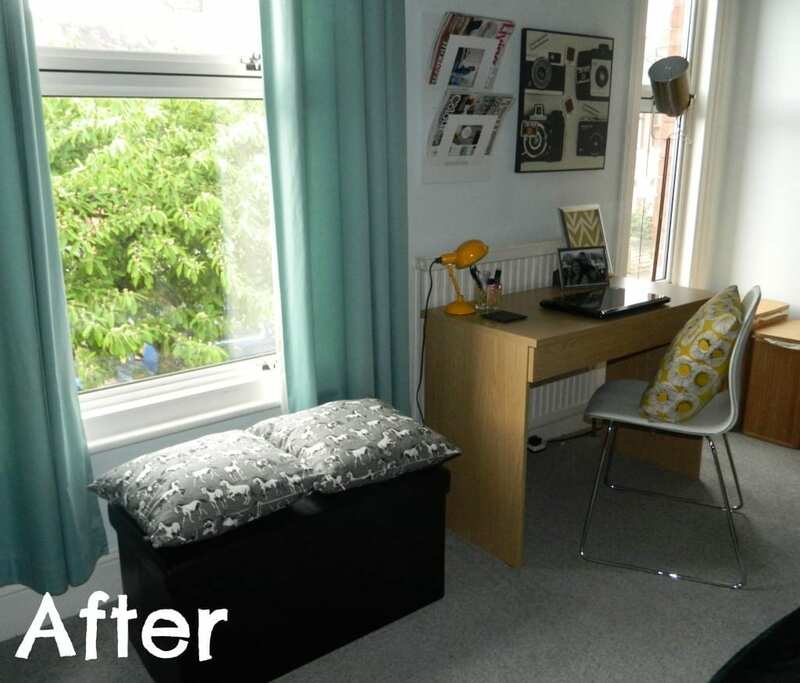 Your desk area is so nicely managed and transformed! I would like to give a huge thumbs up for this excellent work done! Pingback: Do you have an Inspiring Workplace? Great makeover. Very bright and fresh, must be bringing a lot of inspiration for writing, the camera picture on the wall doesn’t fall short too! Congratulations, loving your blog! Love this series! I read and enjoyed parts 2 and 3 but I can’t seem to find part 1. Absolutely love the noticeboard. I would love this on the wall in my office, that is when I actually manage to get an office space sorted! Really like the floor lamp too. It all works very well together and I can imagine you are now loving ‘going’ to work!